This video is about making Chicken Piccada. Its quick and very easy to make! YUM YUM!!! In a bowl, combine flour, garlic salt, basil, pepper and salt. Mix well. 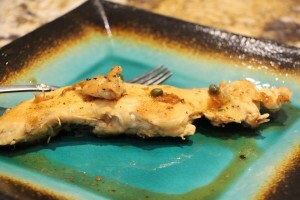 Heat a frying pan with olive oil and cook chicken pieces in it. Sprinkle the prepares mixture over chicken pieces (after placing in pan). Cook for few minutes until golden brown. Once done, remove the chicken pieces. Add butter to the same pan with drippings and scrape the bottoms. Add white wine, lemon juice, chicken broth, capers and allow to simmer for a while. Add chicken pieces and cook until breasts combine with juice.